A 35-year-old male with a history of chronic bronchitis and sinusitis presented to an outside hospital with chest pain and shortness of breath. The patient denied cigarette use but upon further questioning reported a prior history of habitual marijuana smoking, which he quit in 2008. Physical examination revealed expiratory wheezing and abnormal right-sided breath sounds. His vital signs, including respiratory rate and oxygen saturation were within normal limits. Initial laboratory studies, including a complete blood count test and basic metabolic panel, were unremarkable. A chest radiograph revealed a mild to moderate right apical pneumothorax. 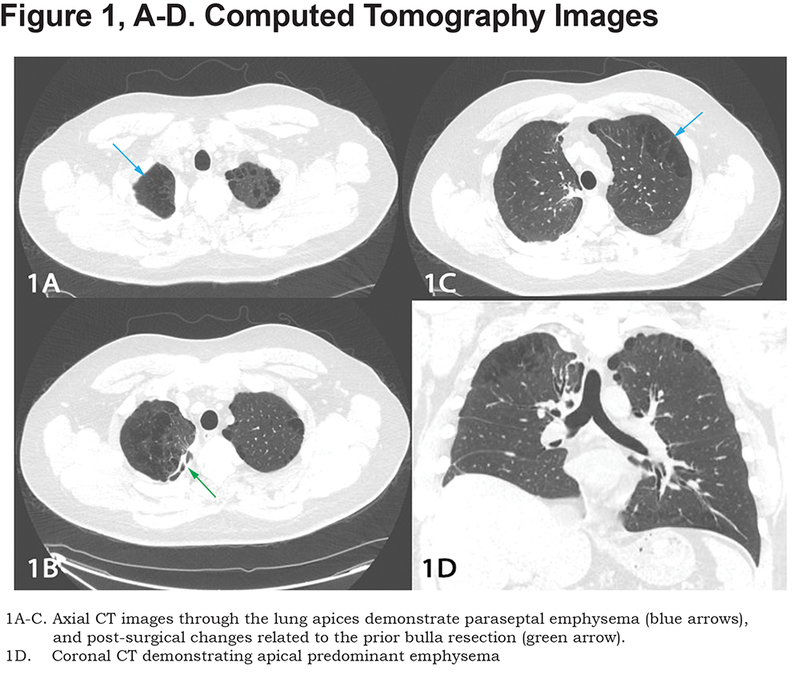 Computed tomography (CT) of the lungs demonstrated moderate para-septal emphysema with associated bullous changes. The patient underwent video-assisted thoracoscopic surgery for a right-sided bulla resection and pleurodesis. Subsequent pulmonary function tests demonstrated no significant evidence of obstruction. The patient was referred to our pulmonary clinic for further evaluation and management. A repeat CT of the lungs was performed as a baseline following the patient’s thoracic surgery. CT showed para-septal emphysema with sequalae of pleurodesis in the right upper lung (Figure 1). The patient reported improvement in his shortness of breath since his bulla resection and has maintained abstinence from smoking tobacco and marijuana. Marijuana is one of the most commonly used illicit drugs in the world. Increasing public support for marijuana law reform and legalization in multiple regions and countries, has resulted in a stark rise in the use of marijuana over the last ten years.1 Additionally, there is a public perception that smoking marijuana has minimal adverse health effects. As its use becomes more prevalent, it is important to understand and publicize its effects on pulmonary structure, function, and symptoms. Long-term cannabis use is known to impair large airway function leading to airflow obstruction and hyperventilation.2,3 This is a result of persistent inflammation and edema of the tracheobronchial mucosa induced by smoking marijuana. In fact, Gong et al4 reported that the histological effects of 3-4 marijuana cigarettes on the airway were comparable to smoking 20 tobacco cigarettes. These patients experience the common symptoms of chronic bronchitis including wheezing, a chronic cough and increased sputum production. Several articles over the last 20 years have reported a correlation between cannabis smoking and apical emphysema with large bullae formation, specifically in younger patients3,5,6 This phenomenon has been referred to as "marijuana lung". Most of the cases observed with bullous emphysema are in patients with heavy exposure to marijuana. These patients usually present with a spontaneous pneumothorax, secondary to bullous rupture. The exact mechanism leading to the bullous formation with marijuana use is unknown, but it may be due to the direct toxicity from the marijuana components and airway barotrauma. Deep inspiratory maneuvers commonly performed with smoking marijuana may contribute to the predominant apical involvement. A recent study in 2013 from Fiorelli et al7 demonstrated a high incidence of inflammatory cells in the lungs of marijuana users, which may lead to lung injury and bulla formation. Scientifically proving this phenomenon has been difficult, in part due to the lack of studies in animal models and the limited ability in collecting data from individual users, due to marijuana's illegal status. Additionally, many of these patients concomitantly use tobacco which itself can be a cause for prominent para-septal emphysema in young patients. While several case reports and case studies have described a connection of bullous emphysema and marijuana use, most studies have been unable to confirm a definite link.